The Vasil Bojkov Collection is an amazing collection of over 3000 incredible artefacts and archaeological items that have been collected over many years by the Thrace Foundation. It includes many artifacts, made of a of range different materials, dating from as far back as 4 000 BC up to the 6th century AD. There are many exquisite artefacts and items in the collection that are made of precious metals and they demonstrate an incredible level of craftsmanship. The range of the types of artefacts the collection comprises of is really incredibly varied, it includes: vessels, weapons, household objects, vases, adornments, harnesses, clay, belt appliqués and even some stone sculptures. Probably the most impressive items are the vessels, which also represent the core of the collection and comprises of utensils and vases ranging from the 8th century BC to the 6th century AD. The finest examples are the three bronze and silver horns and rhyta, these are the only known specimens in the world. There are three of these identical rhyta from the collection of Vasil Bojkov, they are decorated with stags and are incredibly detailed. The only decipherable difference between them is a slight variation in the finish of the fur on the animals. The horns are vertically fluted and decorated with a beautiful ivy wreath. The stags are imposing creatures with well defined muscles, they have elements of a horses harness on their faces, these decorations are meticulously picked out and emphasised by intricate gold gilding. 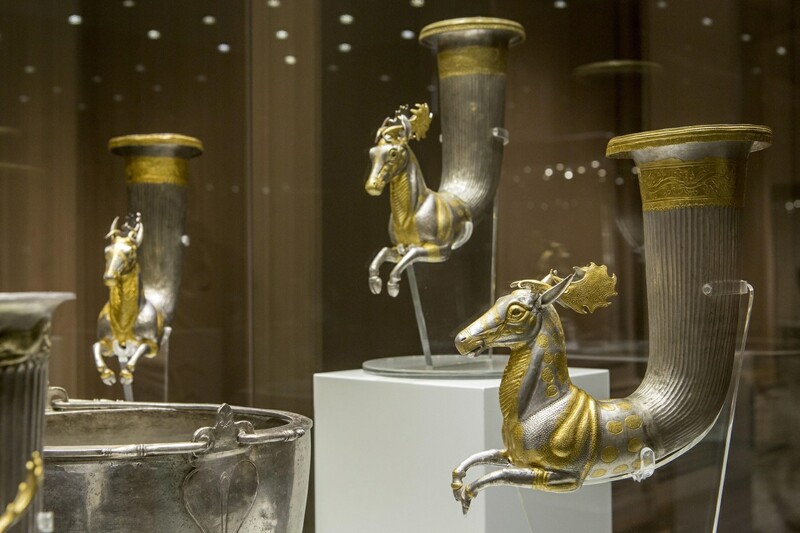 These rhyta were forged by Thracian silversmiths in the second half of the 4th century. The artefacts were produced by workshops of the ancient world in the Middle and Near East, Asia Minor, continental and island Greece, North Aegean coast, the Greek neighbor Thrace and Macedonia, Scythia in the North Black Sea steppes, as well as Etruria and South Italy (Magna Graecia), the Iberian peninsula. Professor Sideris, one of the leading experts of Thracian artefacts and a professor on the restoration team at the Thrace Foundation is especially enchanted by a pair of golden bracelets decorated with intricately detailed snakeheads, another of his favourite items in the collection are the scissors with gold and silver plate which have spectacular and unique decorations. He believes this collection is incredibly important as it contains such rare items of exquisite and incredible beauty. ‘’Coming from the fact that I am a specialist in metal vases, I am highly interested in two specific types of artefacts – Thracian, Eastern and Greek rhytons and silver attics wares. Both groups include in themselves one of the best examples of such items known to humanity. They also explain to us the importance of the creation, spreading the social value that those items had in the ancient world’’, says Professor Sideris. The Vassil Bojkov Collection has been exhibited in several world capitals and widely thrilled captivated audiences. The collection has such a vast array of different styles and objects that are unique and often one of a kind and easily competes with other world class exhibitions such as the the ‘’Metropolitan” in New York, the Hermitage in Saint Petersburg and the Louvre Museum in Paris.